The trend would continue throughout the century as the city crept further and further northward. With the completion of Central Park and the opening of the Ninth Avenue elevated train in the 1870s, the Upper West Side experienced a flurry of development. 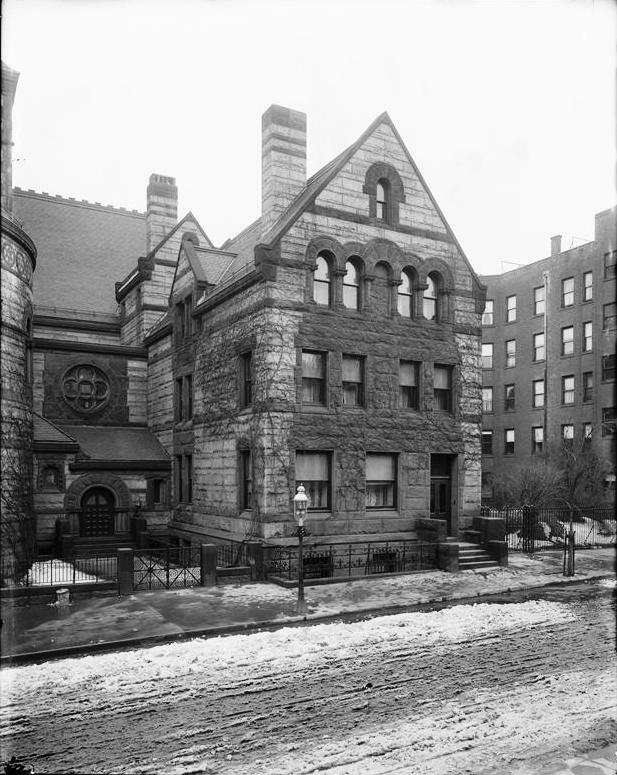 Wealthy merchant class parishioners settled into broad brownstone homes. Before long Trinity Church would need another chapel—its fourth. In fact, like Trinity’s other chapels—St. John’s, St. Paul’s and Trinity Chapel—it would be an impressive and splendid church structure. 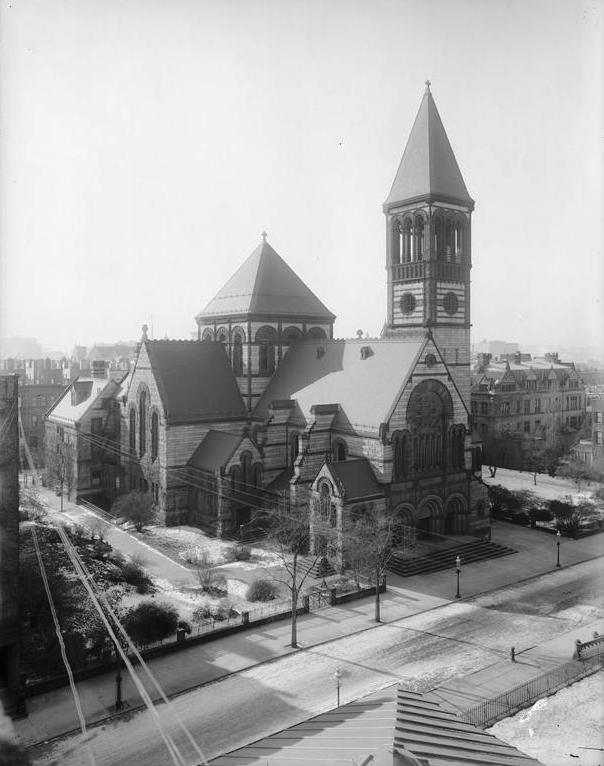 The Architectural Record would point out that “The Romanesque had by this time succeeded the Gothic fashion, and Mr. William Appleton Potter had addicted himself to the Richardsonian phase of Romanesque with enthusiasm.” With his design for St. Agnes Chapel Potter would bring Romanesque to a level unseen to date in Manhattan. 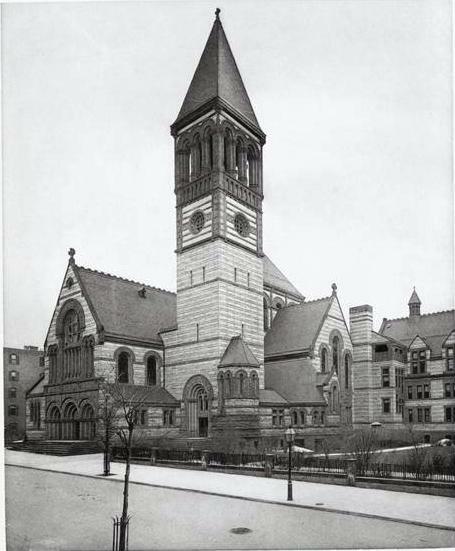 On May 19, 1890 the cornerstone was laid with a ceremony that The New York Times deemed “unusually impressive.” Bishop Henry Codman Potter (coincidentally or not, the architect’s brother) oversaw the procedure that included a procession up 10th Avenue, which had been closed for the occasion. If 1,000 onlookers needed a hint as to the grand chapel that would rise here, they needed only to notice the tools used in the laying of the cornerstone. A year and a half later, as the chapel was under construction, The Times remarked that “St. Agnes is not only the latest undertaking in the line of chapels on the part of Trinity, but it is the most costly of the several auxiliary church enterprises.” The newspaper estimated the final cost at just under $1 million. 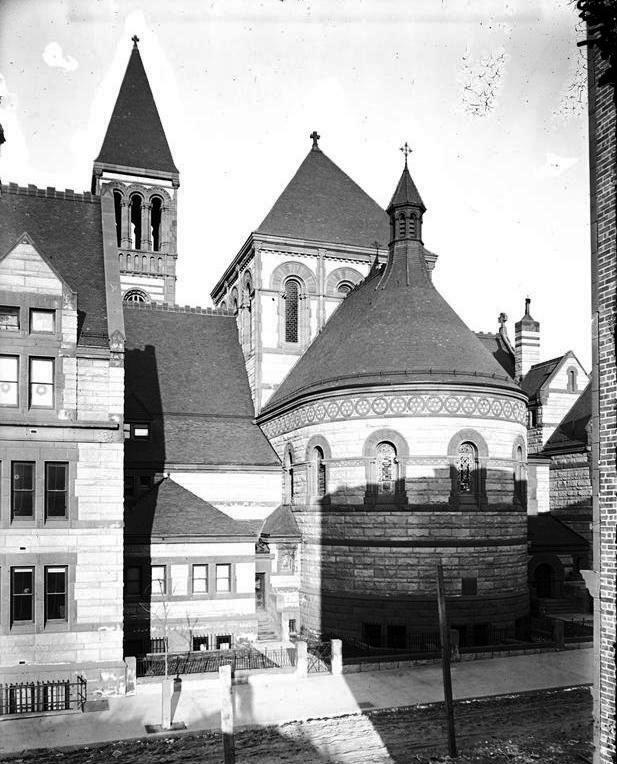 The completed church would stretch 174 feet from front to back—40 feet longer than Trinity Church. The chancel, 63 feet long and 38 feet wide, was “with the exception of those of cathedrals” the largest in the country, according to The Times. The newspaper went on “The arch of the ceiling is laid in gold and incrustations in imitation of jewels. The effect is like that of the interior of an Oriental mosque.” The cavernous interior held two pipe organs and the mosaic floor was imported from Europe. 1,400 worshipers could be comfortably accommodated. The exterior was composed of brownish spotted granite with brownstone trim. Commanding attention was the tall bell tower, or campanile, which rose 185 feet above the morning chapel. Inside was a “Westminster peal” of four immense bronze bells, the largest of which weighed nearly four tons. A 40-foot square central tower, 100 feet high, capped the intersection of the nave and transept. The other buildings blended harmoniously with the church. The clergy house contained 20 large rooms. “It is of the most modern interior architecture,” said The Times, “and finished in ash throughout.” The parish house accommodated the Sunday school on the third floor, capable of seating 600 persons. The morning chapel, decorated to match the interior of the main chapel, would seat about 150. As Trinity Church prepared for the consecration of the new chapel, it took steps to make the music of St. Agnes unsurpassed. G. Edward Stubbs was hired away from St. James Church on Madison Avenue and 72nd Street. “Mr. Stubbs is well and favorably known as a specialist in the training and direction of boys choirs…His success in the musical field has been pronounced, and he has latterly had charge of the training of the celebrated choir of male voices at the General Theological Seminary,” remarked The Times. 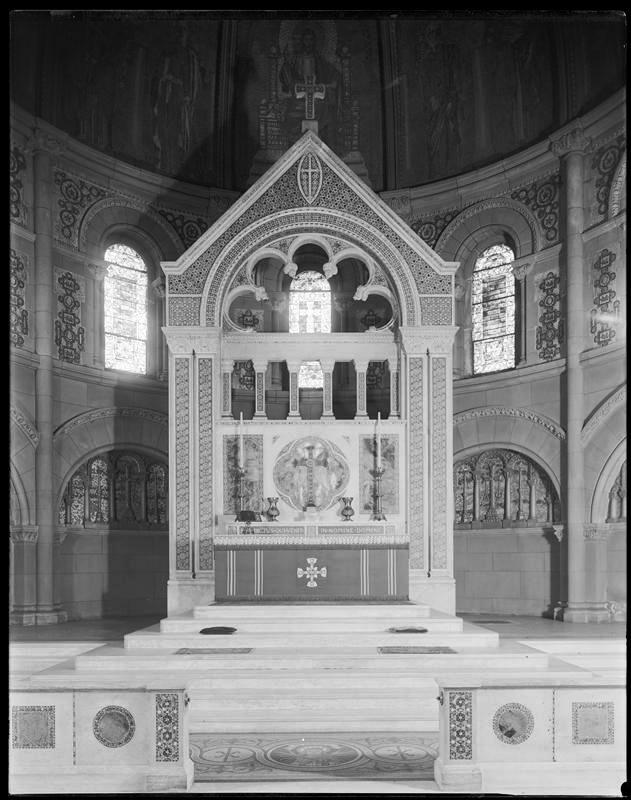 The New-York Tribune commended that “The somber decorations of the nave contrast sharply with the brilliancy of the altar and the chancel.” The “brilliancy” was in part due to the communion and altar pieces, made by Gorham Manufacturing Company. Two communion sets were of solid silver; two matching sets were bronze. The silver services consisted of ten pieces each—a flagon, a ciborium, two plates, a chalice spoon, three glass cruets and two chalices—weighing a total of 530 ounces. On the altar was a bronze cross, said to be among the largest Romanesque crosses ever cast. In addition were two “large and elaborate” bronze candlesticks, three feet high, and two bronze vases 16 inches high. The cost of the altar pieces was $5,500—approximately $150,000 by today’s standards. By the turn of the century St. Agnes membership had soared to over 2,000 persons. It was the scene of high profile funerals and weddings. Here on the afternoon of November 29, 1904, was the wedding of Arthur Iselin and Eleanor Jay. Bishop Potter pronounced the benediction to the assembled guests that included Fishes, Belmonts, Mackays, Sloanes, Vanderbilts, Burdens, de Peysters, Schermerhorns, Astors, Morgans, Goelets and Harrimans among others—in short every important name of Manhattan’s elite social list. Among the most interesting members of the parish was Mrs. John Alden Gaylord. Born in Zurich she traveled to New Orleans at the age of 16 to live with a wealthy uncle. Described as “a blonde beauty,” Eugenia met the Count de Cenola and three months later was married in Paris. Just a year and a half later the Count died and the teen-aged widow returned to the United States where she married the stock broker Gaylord. As the Upper West Side became more and more fashionable, the Gaylords moved into an impressive Riverside Drive residence and began attending St. Agnes. Eugenia was interested in the financial affairs of her husband and assisted him in his brokerage office—a highly unusual pastime for a socialite. Then came the Financial Panic of 1907. Eugenia Gaylord, once a society belle of New Orleans and Paris, was wiped out. For the next twenty years she relied on help from friends and former business associates of her husband. Then she disappeared. The newspaper published her predicament, asking for hand-outs. Although money was donated, welfare organizations were frustrated “as she refused to stay in homes to which she was sent. She was supported by friends until she ‘no longer knew or cared where she lived,” said The Times. She was sent to the Metropolitan Hospital on Welfare Island. Here she lived until the age of 83. “Her mind, once brilliant, dwelled continuously on the events of the ‘90s,” lamented The Times. 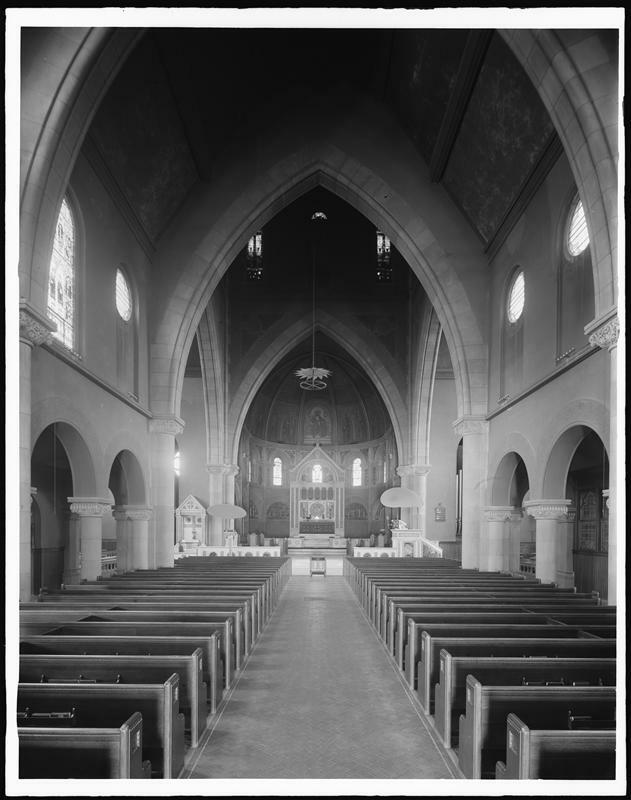 In 1942 the stained glass windows were removed and replaced with plate glass to safeguard them “against possible air raid damage,” according to the Rev. Dr. Frederick s. Fleming, rector of Trinity Church. By now the population of the Upper West Side was made up of more Roman Catholics and Jews than Episcopalians. St. Agnes was in trouble financially. Trinity Parish embarked on a “streamlining” process to divest itself in underutilized real estate. 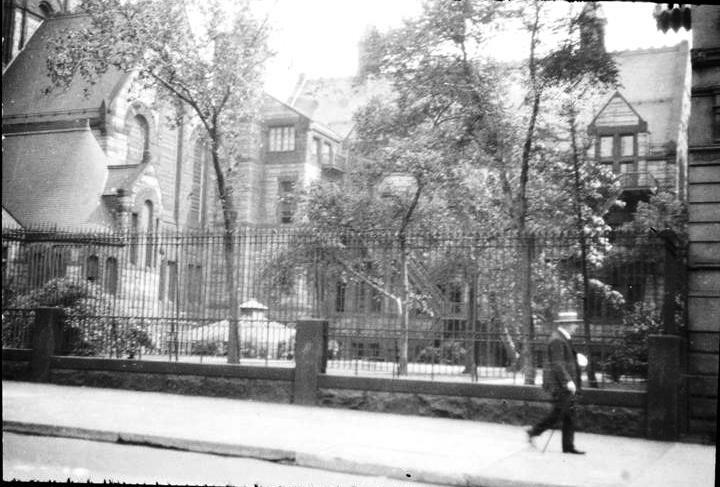 Next door to St. Agnes was the venerable Trinity School, a private institution for boys. Unlike the chapel, the school was doing just fine. 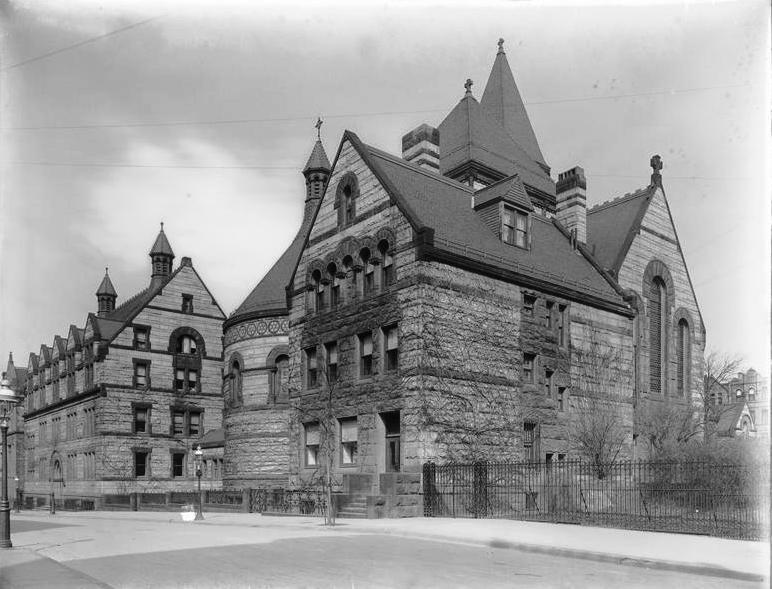 In 1942 the school offered the Parish $50,000 for the group of buildings—which had cost just under $1 million half a century earlier. The school immediately sold off everything in the buildings—the high altar, the bronze bells, the stained glass and organs, even the hymnals. During the summer of 1944 William Appleton Potter’s magnificent Romanesque trio was bulldozed with little being salvaged. The European mosaic floors were crushed to provide landfill for the site. The purpose for which the school needed “to provide more adequately” for its enrollment became evident. Where St. Agnes Chapel had stood, a baseball field was installed. In the 1930's my mother, Edith Riesenberg Atheling, was a parishioner of St. Agnes Chapel and I attended the Sunday school and sang in the children's choir. I believe the minister was a Dr. Belanger.